There are remains of the more ancient times of Britain whose uses no antiquarian writers have attempted, by the aid of tradition or imagination, satisfactorily to explain. They are, to a certain extent, works of art; they exhibit evidences of design; but it would appear as if the art worked as an adjunct to nature. 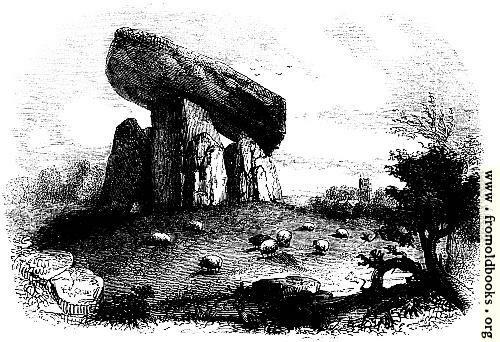 The object of the great Druidical monuments, speaking generally, without reference to their superstitious uses, was to impress the mind with something like a feeling of the infinite, by the erection of works of such large proportions that in these after ages we still feel that they are sublime, without paying respect to the associations which once surrounded them. So it would appear that those who once governed the popular mind sought to impart a more than natural grandeur to some grand work of nature, by connecting it with some effort of ingenuity which was under the direction of their rude science. Such are the remains which have been called Tolmen; a Tolman being explained to be an immense mass of rock placed aloft on two subjacent rocks which admit of a free passage between them. Such is the remarkable remain in the parish of Constantine in Cornwall. 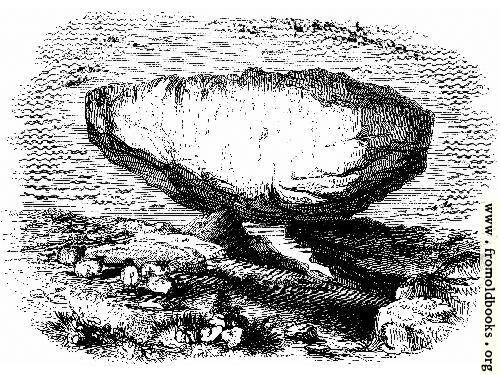 “It is one vast egg-like stone thirty-three feet in length, eighteen feet in width, and fourteen feet and a half in thickness, placed on the points of two natural rocks, so that a man may creep under it.” (Fig. 41.) There appears to be little doubt that this is a work of art, as far as regards the placing of the huge mass (which is held to weigh seven hundred and fifty tons), upon the points of its natural supporters. If the Constantine Tolman be a work of art, it furnishes a most remarkable example of the skill which the early inhabitants of England had attained in the application of some great power, such as the lever, to the aid of man’s co-operative strength. But there are some remains which have the appearance of works of art, which are, probably, nothing but irregular products of nature,—masses of stone thrown on a plane surface by some great convulsion, and wrought into fantastic shapes by agencies of dripping water and driving wind, which in the course of ages work as effectually in the changes of bodies as the chisel and the hammer. 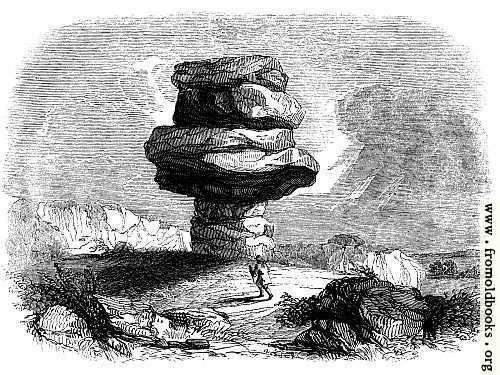 Such is probably the extraordinary pile of granite in Cornwall called the Cheesewring, a mass of eight stones rising to the height of thirty-two feet, whose name is derived from the form of an ancient cheese-press (Fig. 47). It is held, however, that some art may have been employed in clearing the base from circumjacent stones. 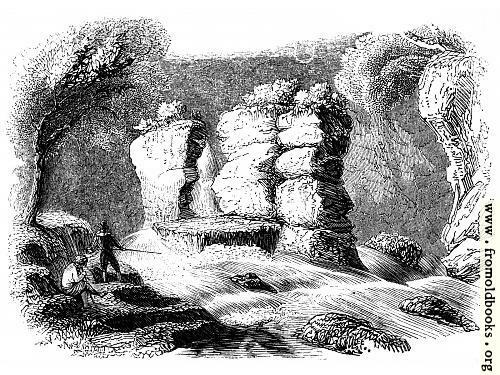 Such is also a remarkable pile upon a lofty range called the Kilmarth Rocks, which is twenty-eight feet in height, and overhangs more than twelve feet towards the north (Fig. 46). 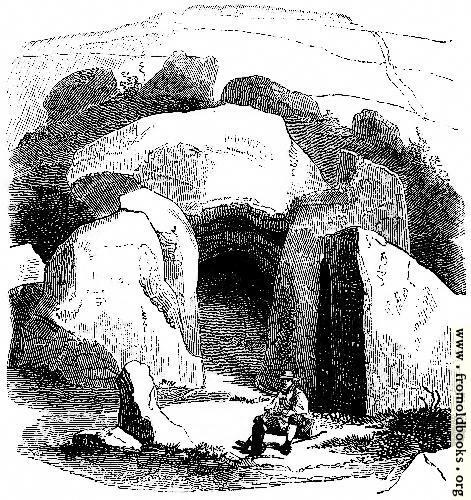 The group of stones at Festiniog in Merionethshire, called Hugh Lloyd’s pulpit (Fig. 48), is also a natural production. But there are other remains which the antiquaries call Logan, or Rocking-stones, in the construction of which some art appears decidedly to have been exercised. Cornwall is remarkable for these rocking-stones. Whether they were the productions of art, or wholly of nature, the ancient writers seem to have been impressed with a due sense of the wonder which attached to such curiosities. Pliny tells of a rock near Harpasa which might be moved with a finger (placed no doubt in a particular position) but would not stir with a thrust of the whole body. Ptolemy, with an expression in the highest degree poetical, speaks of the Gygonian rock, which might be stirred with the stalk of an asphodel, but could not be removed by any force. 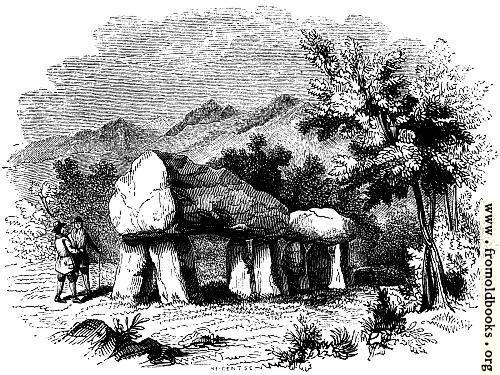 There is a rock-ing-stone in Pembrokeshire, which is described in Gibson’s edition of Camden’s ‘Britannia,’ from a manuscript account by Mr. Owen: “This shaking stone may be seen on a sea-cliff within half a mile of St. David’s. It is so vast that I presume it may exceed the draught of an hundred oxen, and it is altogether rude and unpolished. 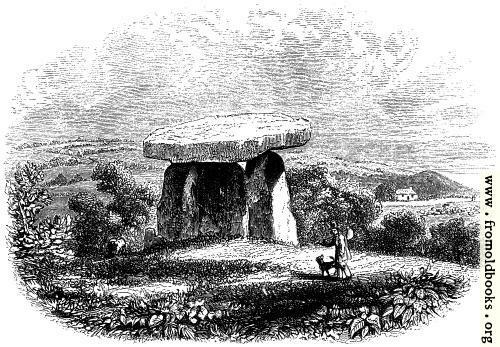 The occasion of the name (Y maen sigl, or the Rocking-stone) is for that being mounted upon divers other stones about a yard in height it is so equally poised that a man may shake it with one finger so that five or six men sitting on it shall perceive themselves moved thereby.” There is a stone of this sort at Golcar Hill, near Halifax in Yorkshire, which mainly lost its rocking power through the labours of some masons, who wanting to discover the principle by which so large a weight was made so easily to move, hewed and hacked at it until they destroyed its equilibrium. 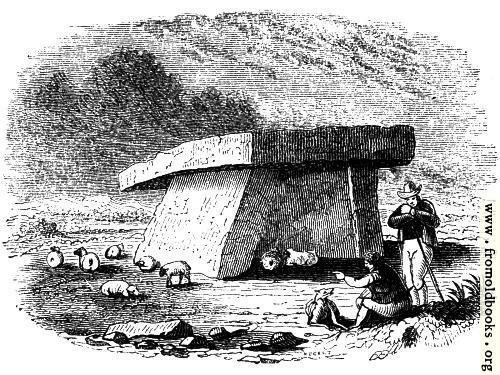 In the same manner the soldiers in the civil wars rendered the rocking-stone of Pembrokeshire immoveable after Mr. Owen had described it; but their object was not quite so laudable as that of the masons, who sought to discover the mystery of the stone of Golcar Hill. The soldiers upset its equipoise upon the same principle that they broke painted glass and destroyed monumental brasses; they held that it was an encouragement to superstition. In the same way the soldiers of Cromwell threw down a famous stone called Men-amber, in the parish of Sithney, in Cornwall, which a little child might move; and it is recorded that the destruction required immense labour and pains. 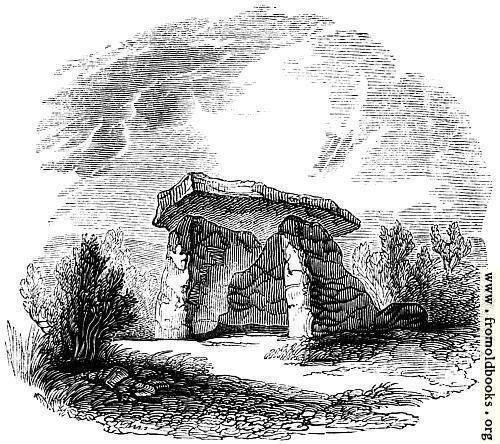 Some few years ago one of these famous rocking-stones, on the coast of Cornwall, was upset by a ship’s crew for a freak of their officers; but the people, who had a just veneration for their antiquities, insisted upon the rocking-stone being restored to its place; it was restored; but the trouble and expense were so serious, that the disturbers went away with a due sense of the skill of those who had first poised these mighty masses, as if to assert the permanency of their art, and to show that all that is gone before us is not wholly barbarous. It is a curious fact that the tackle which was used for the restoration of this rock-ing-stone, and which was applied by military engineers, broke under the weight of the mass which our rude forefathers had set up. The rocking-stones which are found throughout the country are too numerous here to be particularly described. 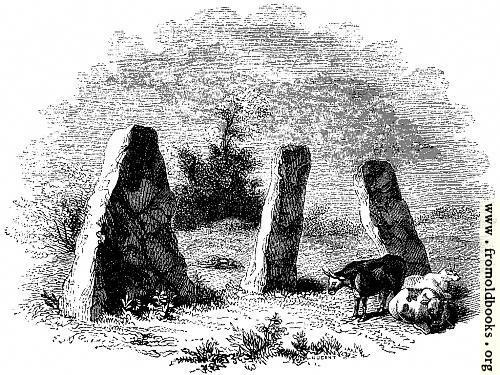 They are in many places distinctly surrounded by Druidical remains, and have been considered as adjuncts to the system of divination by which the priesthood maintained their influence over the people. Invenient lapidem, regnare tenentur ibidem. 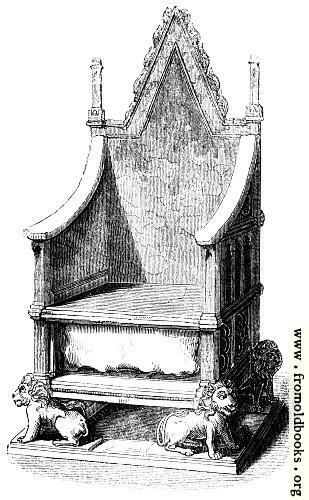 * The Coronation Chair, the seat of which rests upon this stone of destiny, is also represented in the illuminated engraving which accompanies this portion of our work. It is a fac-simile of a highly finished architectural drawing, and is printed in oil colours from twelve separate plates, so united in the printing as to produce a perfect outline, and to give all the various tints of the original.